"Correct El Jefe. But then again you did make up the rules." One of the more enjoyable shows on television is the CBS series NCIS. It and CSI New York are the only network shows I really like to watch, and although it is a bit unrealistic in terms of office interaction (what happens between these characters would result in lawsuits, civil rights citations, and sexual harassment suits) it is consistently fun to watch. 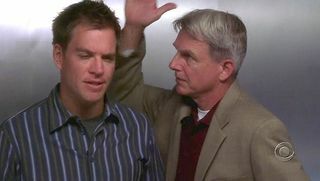 One of the running themes on the show is a series of rules which the commanding agent Gibbs (played by Mark Harmon) were taught by his former superior Mike Franks. He passes these rules on to agents, and they are revealed a little bit at a time on the shows. For example, rule 13: Never, ever involve lawyers. This is something NCIS does more than any other crime show, lawyers are almost never involved. For the record, here's a list of every rule that's been mentioned on the show; there are 51 to date, but only 23 have been revealed. You'll note that there are two rule number 1's. Whether that was a continuity error or they just are trying to get across the point that these aren't as hard and fast as a book of laws is not clear. Never let suspects stay together/Never screw (over) your partner. If you have a secret, the best thing is to keep it to yourself. The second-best is to tell one other person if you must. There is no third best. Never get personally involved in a case. It's better to ask forgiveness than ask permission. Never, ever interrupt Gibbs in interrogation. There are two ways to follow. 2nd way - they only notice you. If it seems like someone's out to get you, they are. First things first, hide the women and children. As you can see there are a lot of gaps in there which the writers have not filled in yet, and may never fill. The only character other than Franks and Gibbs who seems to know all the rules is the goth chick forensic genius Abby Sciuto. "It's better to ask forgiveness than ask permission." Standard rule among Navy shipdrivers (or at least it used to be).